Tangled bamboo, fig and pomegranate trees, interspersed by the odd cactus, obscure the path. My feet tread on discarded carob that look like chocolate-coated autumn leaves. The scene is still apart from the rustle of a breeze in the treetops. I push a riotous froth of violet bougainvillea aside and, shielding the sudden burst of sunlight from my eyes with one arm as the undergrowth gives way, stop in awe. Ahead, juxtaposed against the unblemished cerulean sky, is a golden rock face studded with caves connected by the remnants of chiselled stairwells. It is like the doors of a doll’s house have opened, allowing a glimpse into the rooms beyond. A thud as a prickly pear falls from a cactus behind me breaks the stillness, and, startled out of my reverie, I step forwards. This is Cava d’Ispica, a network of cave dwellings hewn into a rampant gorge outside the charming Baroque town of Modica in south-eastern Sicily. 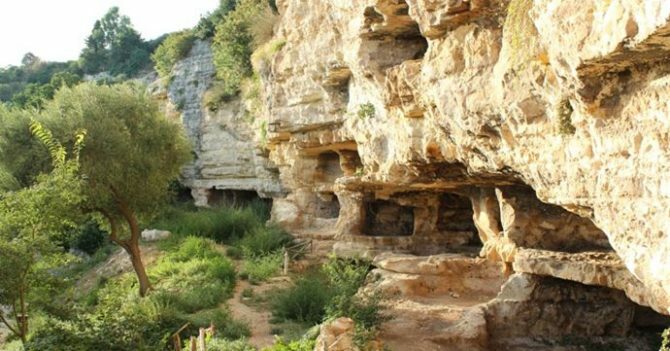 Humans known as ‘troglodytes’ settled in the caves 4,000 years ago, but Grotte Cadute, where I am standing, was used in medieval times. The caves would have been used as stables until even more recently. I step into one of the dwellings, a shaded space now occupied by birds’ nests and lace-like cobwebs. Thanks to the sandstone, the interior glows golden like nearby Modica with its tangled piles of grand palazzi. Indeed, the cave is part-way recognisable as a home: niches dug into the walls would have provided storage space, and there is a nook that looks like the bed compartments in caravans. The whole reminds me of some of the properties you see on the TV show ‘Grand Designs’. The next cave I reach is quite the contrast – so chilling I get a tingle down my spine. A low-slung ceiling droops above a dark space honeycombed with stone graves of all shapes and sizes, like bathtubs lined up in a showroom. Spiders have sheathed some with cobwebs, while tangled greenery is pushing up into others. I don’t fancy climbing along the ridges between the graves as some visitors are doing, but once more in the warm sunshine, I can’t resist scrambling up the remains of a stairwell into a first-floor cave further along the gorge. I’m later impressed to learn that the caves would originally have been across at least five levels. “There is a fascinating combination between natural setting and human activity at Cava d’Ispica. The contrast can make you feel as if you have magically travelled back in time,” emphasises Barbara. She adds that it is similar to some Turkish sites, such as Cappadocia. There’s just one more area of the park to explore: the Hellenistic-Roman Gymnasium. I find myself in a large damp mossy cave with stone benches fashioned along each aspect like in a changing room. Along one wall is chiselled PRE (presbyteroi – Ancient Greek for older people) and on the opposite NEO (neoteroi – young). The gymnasium was an institutional structure created in Classical Greece for military training, but it would also have functioned as a meeting room for assemblies and feasts. Here, it is so well preserved I can almost picture the men gathered. After a morning’s exploration, the heat of the day has left me thirsty. In true Sicilian style, the artisanal café outside the park has just the thing – chilled limonata made of fresh lemon juice, sugar and sparkling water. I sit in the shade and guzzle it, momentarily so lost in thoughts about lives lived long ago that another prickly pear thudding to the ground makes me jump. I half expect to see a person from another time emerging from the undergrowth.